On all Tigercat skidders, the wheels will maintain the speed commanded by the drive pedal, regardless of the traction or pulling torque required. When maximum horsepower is reached, speed reduction occurs automatically. 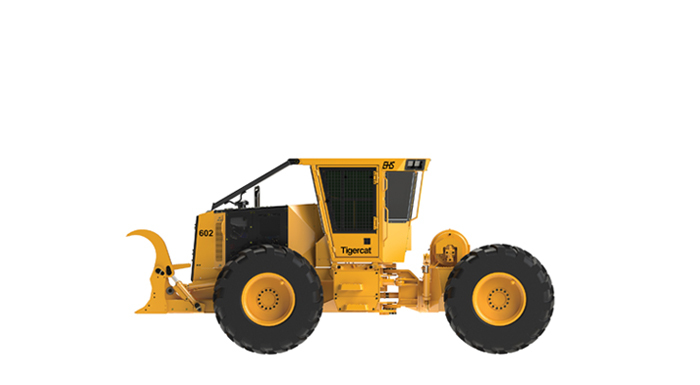 Smooth and continuous traction allows Tigercat skidders to operate with minimal wheel spin. The result is reduced site disturbance, longer tire life, less driveline stress and improved performance in soft or steep terrain. Tigercat skidders can operate at full engine rpm for extreme terrain conditions or variable rpm for enhanced fuel economy. Full hydraulic power is ALWAYS available for all machine functions. Because skidder travel ceases as the drive pedal is released on Tigercat skidders, there is virtually no reliance on the secondary braking system. Brake service is seldom required because secondary braking is rarely used. The operator can maintain excellent vehicle control on slopes.